The Pillowcase Project curriculum is structured by three core principles: Learn, Practice and Share. Students learn about hazards, how to prepare for emergencies, enhance coping skills, practice what they have learned and share their knowledge with friends and family. The program emphasizes the importance of developing an emergency communications plan, fire evacuation plan and emergency contact cards. The Pillowcase Project was created in New Orleans, and was inspired by the story of local university students carrying their belongings in pillowcases during the aftermath of Hurricane Katrina in 2005. 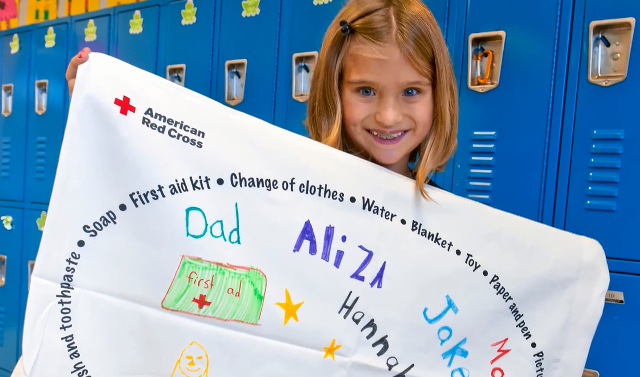 Disney has helped the Red Cross expand the program nationwide by sponsoring The Pillowcase Project since 2013. In addition to The Pillowcase Project, the Red Cross worked with Disney to develop the Mickey and Friends Disaster Preparedness Activity Book, which has been distributed to more than 300,000 youth nationwide. The book teaches kids and families how to prepare for and respond to a wide range of disasters and emergencies through interactive games and activities. The book is available to download in English and Spanish. Disney also sponsored the creation of Monster Guard - the first mobile app created by the Red Cross designed specifically for kids. The app complements The Pillowcase Project, and is a game where children role-play as various monster characters and engage in interactive training episodes for hazards such as home fires, floods and hurricanes. Since the launch of the app in October 2014, there have been more than 50,000 downloads. Other Disney contributions to the Red Cross include the donation of over 300,000 Mickey Mouse plush dolls distributed to kids during disaster-relief operations and hundreds of hours of volunteer service through the Disney VoluntEARS program. Disney is also part of a group of leading companies that are members of the Annual Disaster Giving Program (ADGP). As an ADGP member, Disney helps to ensure the Red Cross is ready to immediately respond when a disaster strikes. For information about The Pillowcase Project in your area, contact your local Red Cross chapter.